Canon, the leading camera and camcorder manufacturing company is bringing an amazing offer for you that may solve your purpose of clicking expressive pictures with great quality. Canon gives captured images a look that perfectly depicts your image with clarity and effectiveness. Either you are professional photographer or enthusiasts of clicking images, Company’s cameras perfectly meet with your need and choice. It has the ability to capture the image with extra zoom functionality to promise great presentation of photos. Canon invites you to bring its camera at home with double zoom feature. 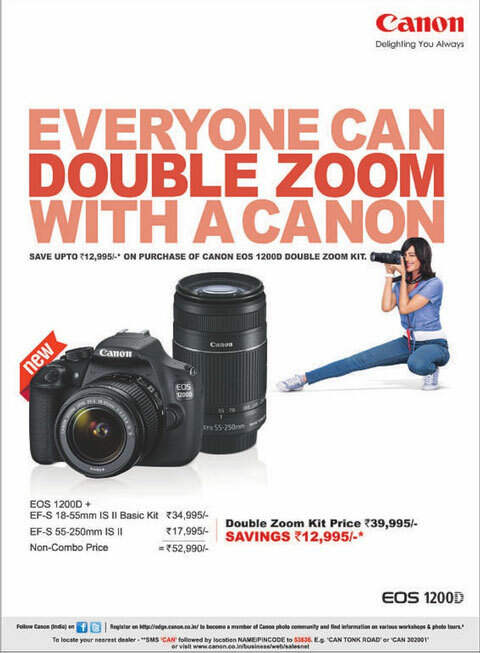 It is offering discount on the purchase of Canon EOS 1200D Double Zoom Kit worth Rs. 52,990 which will cost Rs. 39,995 only and you will save Rs. 12,995 on the kit. The kit has Canon EF-S 55-250mm lens and 18MP Digital SLR Camera. Offer is valid for a limited time period.